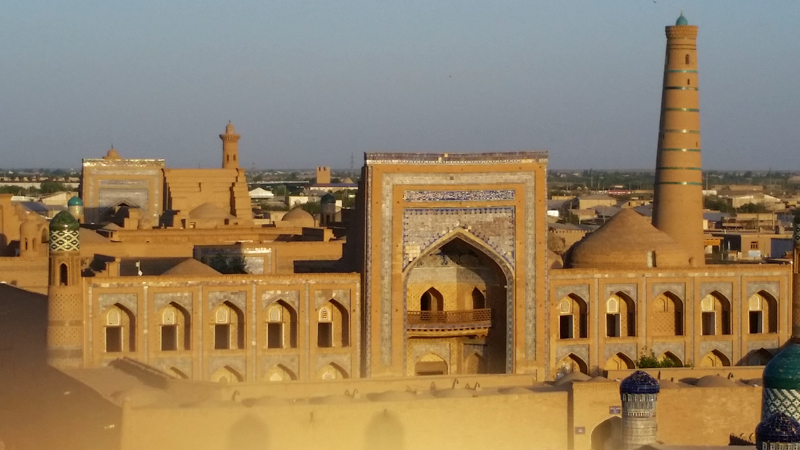 The pictures here are from Central Asia along the Silk Road, from this April and May. 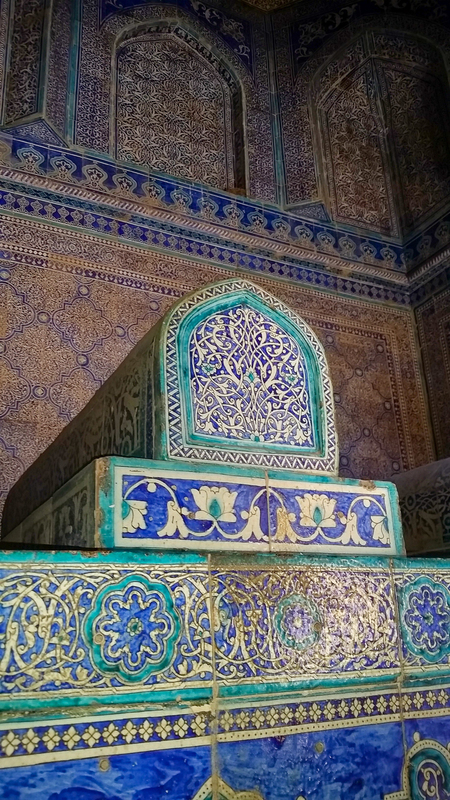 Over the past few weeks the blog has had many photos of mosques, minarets, madrassahs, and mausoleums. First a word about a mosque. 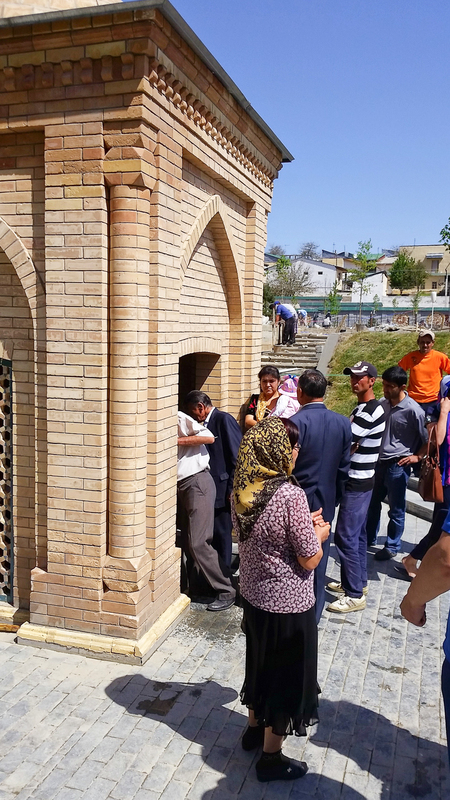 The mosque is a place where Muslims gather for prayers led by an imam who is a Muslim cleric. 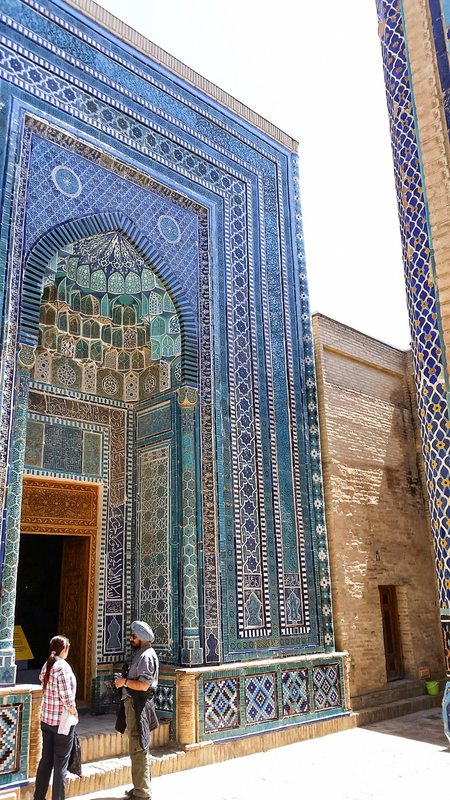 The building is devoid of any pictorial art which is forbidden by Islam hence the decorative art of tile in which beautiful geometric designs and floral motifs abound. The building is not as important as the direction of prayer. 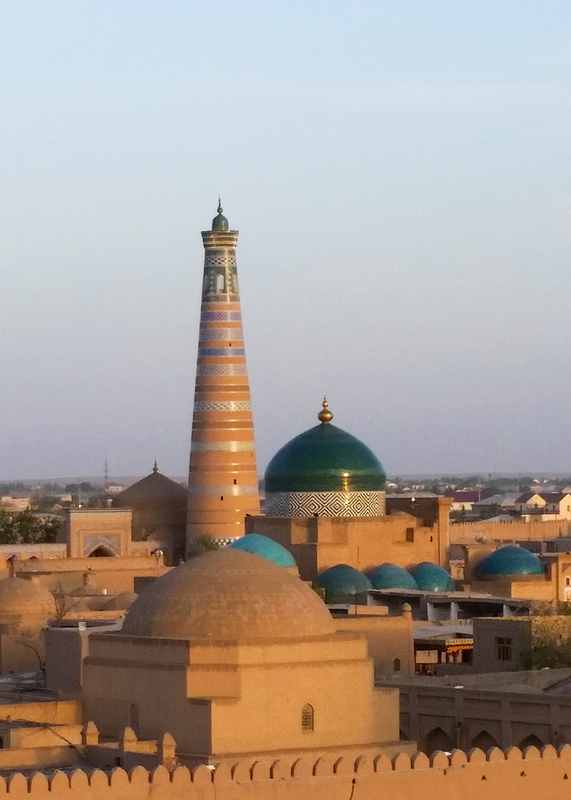 The tower is the minaret from which the imam calls the faithful to prayer five times a day. In the medieval period since the Muslims, Jews and Christians marked the day by prayer, when the imam chanted the call to prayer everyone prayed and marked their confession of faith by direction: Muslims pray facing Mecca in Saudi Arabia where Mohammed was born, Jews pray facing Jerusalem and Christians pray facing east, that is ad orientem. What’s Inside a Mosque? Article from livescience.com . 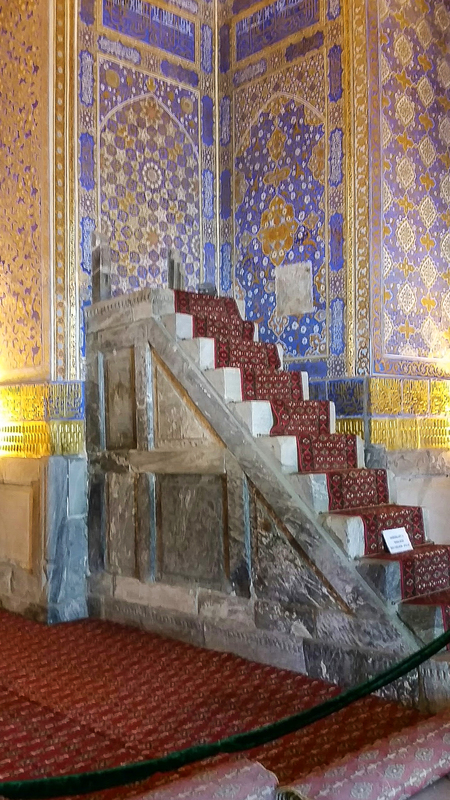 The mihrab indicates the direction of Mecca. 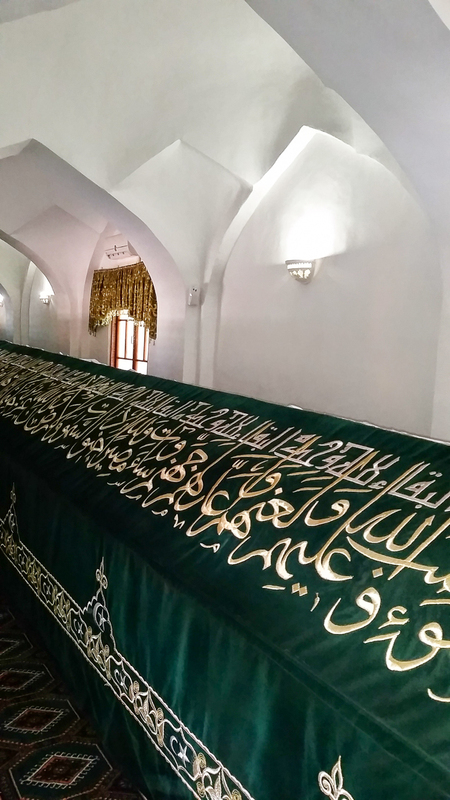 The minbar is the pulpit on which the imam sits and expounds the Koran, the scriptures of Islam. After he finishes expounding the text he then goes to the mihrab where the imam and all the worshippers face Mecca and he leads them in prayer. 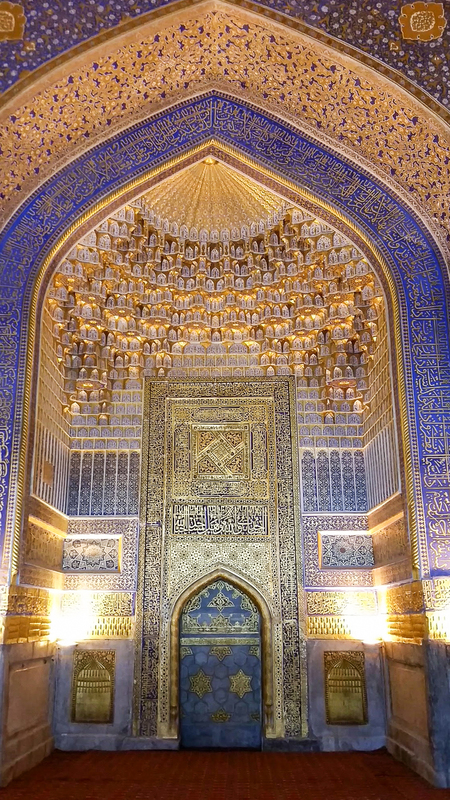 The mihrab is the prayer niche facing Mecca. 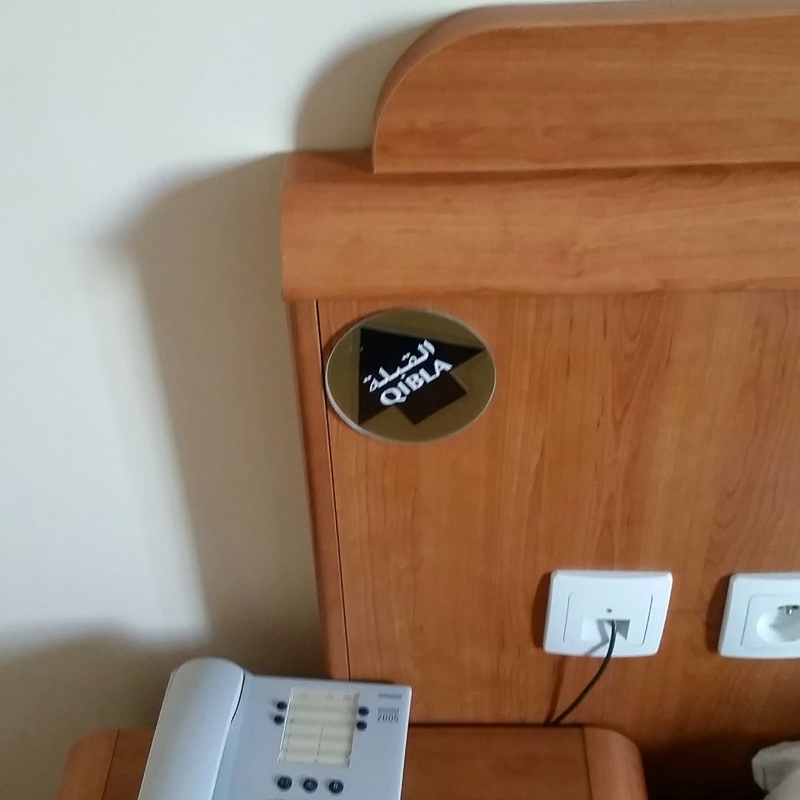 Even the hotels rooms have the direction of Mecca marked so a Muslim knows which direction he should pray. The Madrassah is a theological school where students live and study the Koran and it exposition. It is like what we would call a seminary. The word was borrowed by the Muslims from the Christians who in pre-Islamic times call their institutions for the study of the Scripture, Madrassah. The word is derived from the triliteral root DRS which in Aramaic means to interpret. 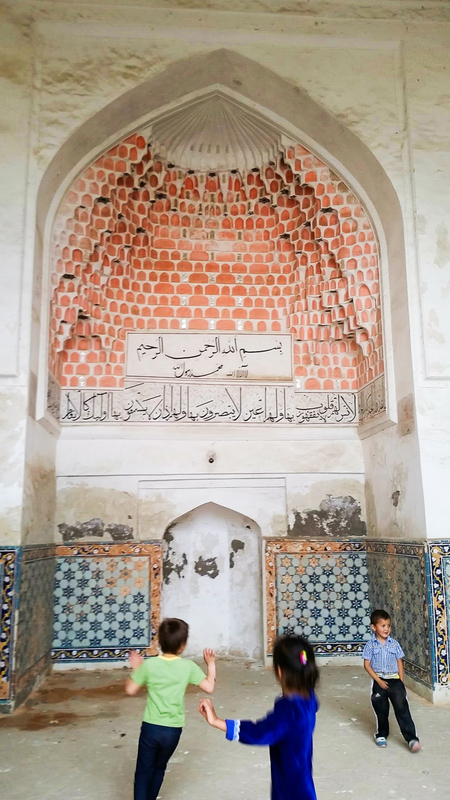 The M makes the verbal form a noun hence the word MaDRaSSah, a place where texts are studied and expounded. A mausoleum is where people are interred. 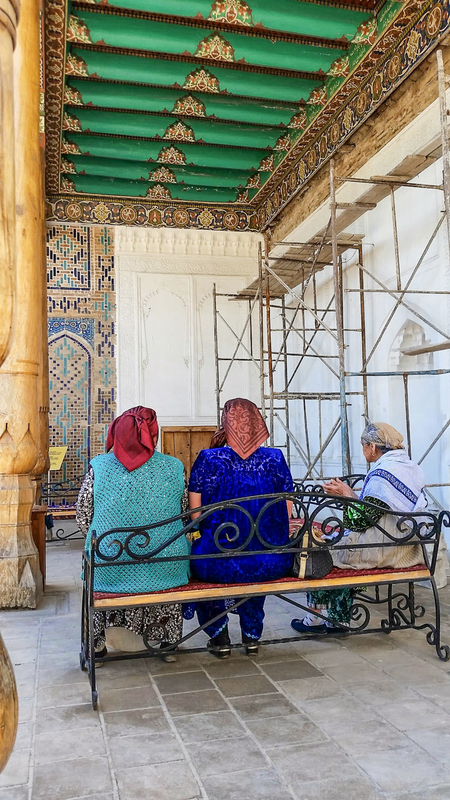 Many Muslims make a pilgrimage to the mausoleum of a “holy man,” a “saint” and pray to the holy man that God grant their wish. 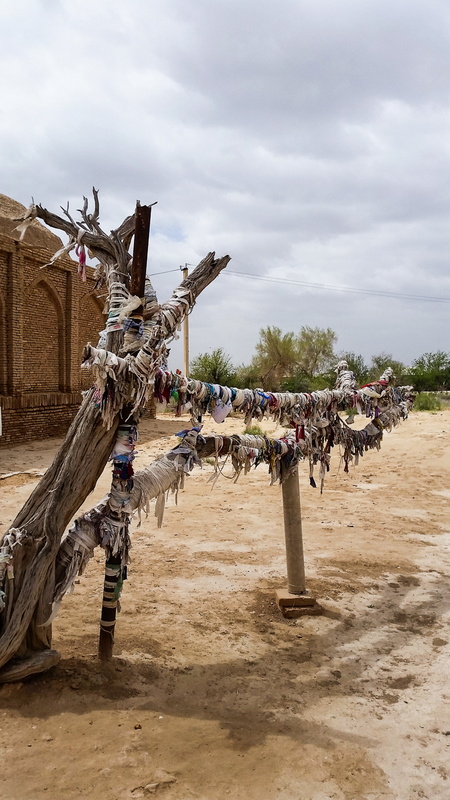 Outside you will sometimes find ribbons that they tie around a piece of wood as they make their wish. 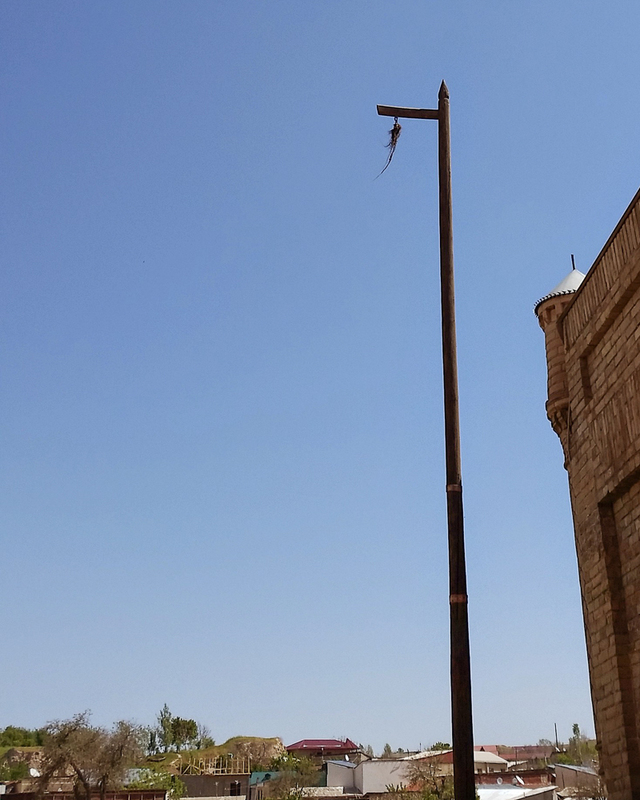 You often see the tail of a yak on a tall pole. My guide said that Muslims believe this keeps evil spirits away. They often walk around the tomb three times as they pray and as the guide says: make a wish. Such things as holy water are important to these Muslims. 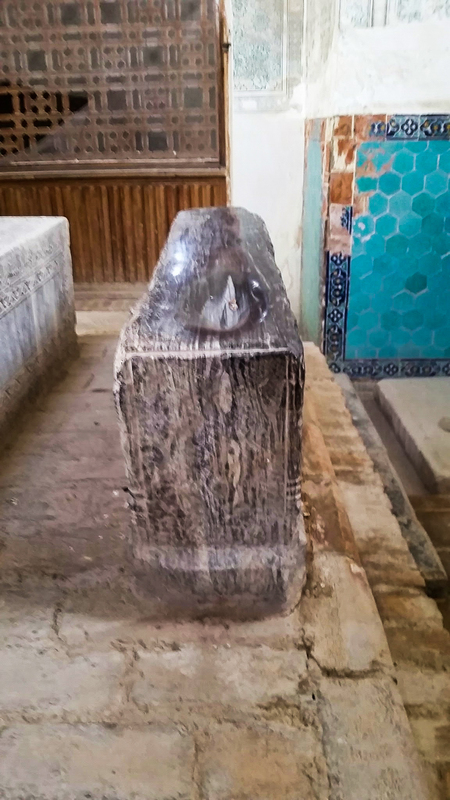 They come to various tombs of holy men where sometimes there are miraculous springs like here at the tomb of Saint Daniel and people take water home to drink so, as my guide said, they would have good luck. After they pray at the tomb, the imam chants a portion of the Koran then recites a prayer in Arabic to which they respond Amen. 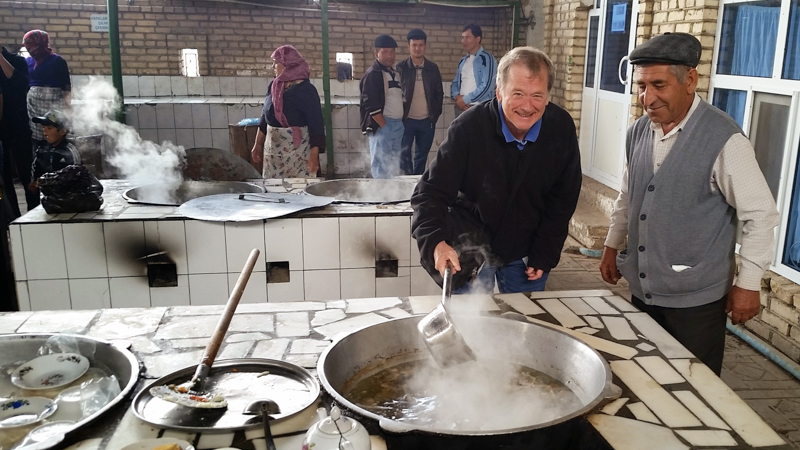 After a wish is granted the whole community is invited to a Zadikkat that is meal prepared for everyone to come and share in thanks that God granted them their wish through a holy man. And then you see a bird. My guide said they believe the soul is a bird for 40 days after death so the birds at the tombs are sacred. At shrines they used to burn candles but imams forbid that now. 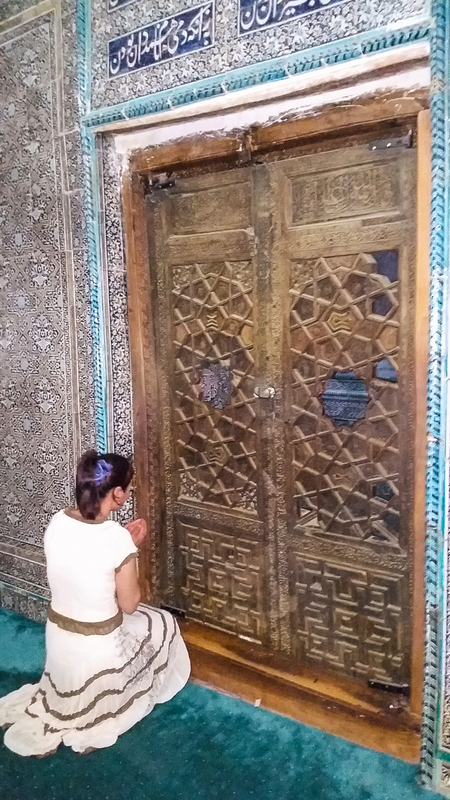 During these few weeks as I have visited ancient sites I have witnessed Islamic piety. They are very devout. As an outsider it is hard to comprehend what sometimes appeared to me as magic and superstition. When I saw this woman at prayer my heart was touched. May she find the one her soul longs for. This entry was posted in Silk Road, Travel and tagged Madrassahs, Muslims, piety, Silk Road, yak tail on May 21, 2015 by frjfkauffmann.